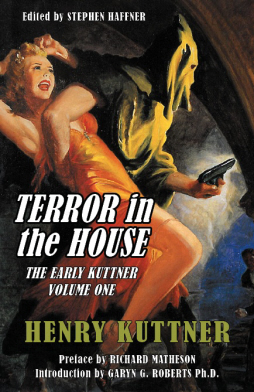 All three winners receive a copy of Terror in the House: The Early Kuttner, Volume One, compliments of publisher Haffner Press. Terror in the House is 712 pages in hardcover, and is edited by Stephen Haffner and illustrated by Harry V. Parkhurst. Congratulations to the winners! 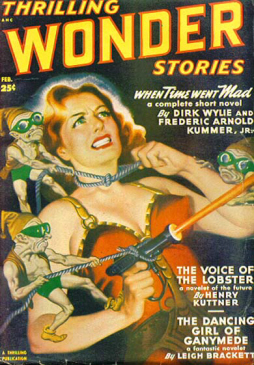 To enter the contest required a one-sentence review of your favorite Henry Kuttner short story. Winners were chosen at random from all eligible entries. The wide range of entries gave us a fine appreciation for just how well Henry Kuttner is still remembered over 50 years after his death, and these concise reviews of readers’ favorite Kuttner tales should help those less familiar with him understand the enduring quality of his fiction. Some of the best entires we received are collected below. My favorite Kuttner story is “We Kill People,” in which a near-future detective is hired to investigate a company that guarantees to be able to kill any desired victim in an untraceable manner. A masterpiece of SF humor that guarantees hilarity by bringing together lovable rabbity aliens from the future whose murderous intentions are thwarted by their poor understanding of earthly culture, and readers’ favorite alcoholic/amnesiac inventor Gallegher. When one wonders what makes “Bells of Horror” such an excellent short story, one needs simply to listen to AC/DC. Hells Bells, man, Hells Bells. The “Bells of Horror,” ringing madness and bringing darkness in the Golden state. My favorite Kuttner story might be “Home is the Hunter” for the first-person depiction of Honest Roger Bellamy and his ultimate “Triumph” over the Hunter society — too, a story that begins with “There’s nobody I can talk to except myself” is hard to resist. I’m sorry to say I’m currently unfamiliar with his stories but with Matheson introducing it I have to look into it. Indeed. Just one of the many fine reasons to check out this excellent book. You can find more about Terror in the House at Haffner Press.